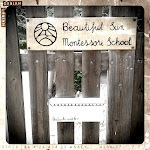 Beautiful Sun Montessori: Community building, first weeks of school. Community building, first weeks of school. Starting the year, one of my main focuses is to build the sense of community among the children. We begin the first week with only the new children coming in for half a day. This gives us the opportunity to build trust with them, and give them a gentle introduction to the general grace and courtesy of our environment. When the returning children join us, the new children have had enough lessons to be able to work independently along with the others. As much as possible throughout the day, we redirect the children to reach out to each other when they need help or a partner. We introduce all the children to each other by playing name games and singing songs that include their names. And in the first days, we put together a "School Family" poster. We hung it this year under our school name right at the entrance of the building where children can visit it often. We include the teachers and maintenance staff (of one). We also put up a long poster with pictures of our daily schedule. This is especially important for the new friends to have an idea of how our day goes. When they get a little homesick, we go to the schedule and can show them exactly when their parents are coming to pick them up. I try to include things that will serve as markers throughout the day, for example, somewhere during the three hours of work ("morning work") there will be writing, so I include this aspect. As well as story reading during the afternoon work period. The calendar serves the same purpose. We write in it anything that will represent a schedule change- for example, when the returning children will join us. When full days will begin, when a returning child who is coming back late will be with us, etc. This year we made a chart with the groups of children that will go into the kitchen to make lunch and set the tables. Last year we would let the children volunteer each week, but I think that having it on a schedule will work better. This way the children can already foresee when it will be their turn to cook. During our first days we also have a "helping hands ceremony" (there's another post about this earlier in the blog). This year, the children picked a new friend to give their helping hand pin to and promised "I'll give you my helping hand." This sets a lovely tone of cooperation among the children right at the fresh start of the year. We have a large blank wall in our lunch room and decided it was a great place to diplay children's work. We hung two lengths of twine from one side to the other and use clothes pins to hang the children's works. For the first weeks we will hang the children's self portraits that they made in the first days. Having all the portraits hanging is another way to reinforce the idea of us all together being a community. Also, it's nice to have them in the lunch room where we can admire them while we eat and converse during lunch.